If you are new with Kilts buying online then this online measuring guide will help you to measure Kilt size using the simple guide below for yourself. It is really necessary to measure kilts before buying it! Well, it’s good to measure before rather buying the wrong size and returning the product for another size. Further, in jeans industry manufacturer has their standards to measure and a short or jeans pant doesn’t reflect your actual waist to best fit because kilt size is larger than your pants size! So to help you out below simple measuring steps will help you to measure the size of your Kilt without getting measured wrongly. This is the first step which is measuring the waist size, put size tape, whether in inches or centimeters, around your body at the point of your waist or belly button or where you are planning to fasten the kilt. Normally a kilt is fasten at the belly button, but it’s totally up to you where you want to fasten it. So measure the point with normal breath (our kilts has little losing for best fitting) and write on the page either in inches or cm to update in your order. It will probably be 2 to 4 inches more than your pants size. It is common. TIP: BIG guys with large bellies may want to wear the kilt around the naval, as it gives a more flattering appearance. Further is about measuring the hip size as it will look good with proper hip size fitting. Why it’s necessary to give hips size? It’s an interesting answer, while we manufacture your kilt we must know either you have normal hips size or not!! Because if your hips cannot fit in your kilt that would be so embarrassing and uncomfortable to wear in public. Because we manufacture a custom made to order kilt so, we take care of each step to manufacture. Now you need to measure the length size which means how long your kilt should hang while standing straight. People wear as per their choice, but a kilt should hang till your knee cap (but it’s not a standard at all its totally up to your choice). But be sure that your starting point is from your waist point or where you plan to fasten your kilt. So it will be a length from your waist till your knee cap or what so ever you want. 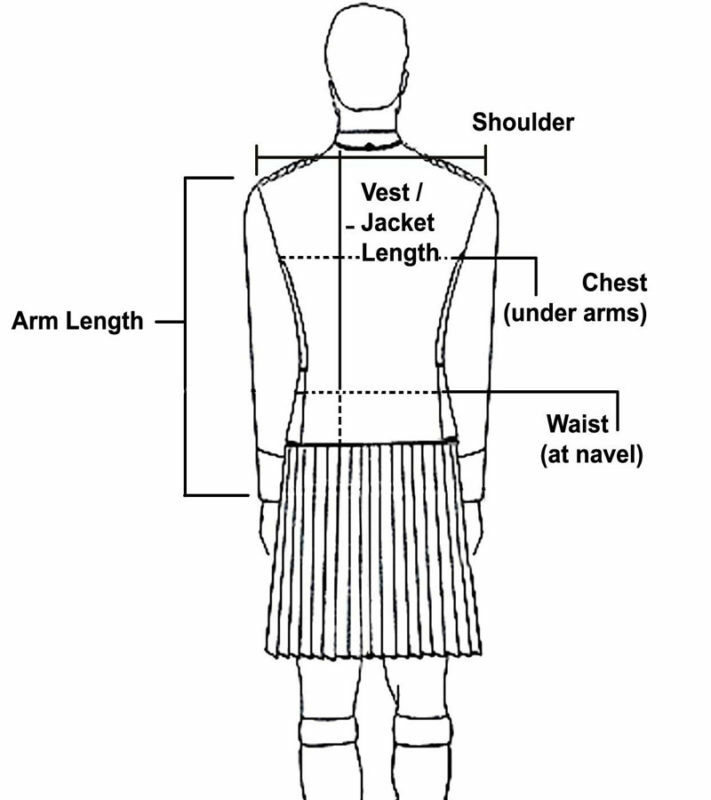 The standard length of kilt or drop length of the kilt is 24” in a male case and 20” in female case. Now you need to measure the Fell measurement to complete the measuring procedure; however, this is an optional measure. Fell is measured from your point of waist till your hips some people want that their kilt should stay with their body rather roomy or airy like fittings of pants at hips so if you will update your fell measurement you can fulfill this requirement as well. Most of the time a Fell measurement is not that necessary because most of the kilts are manufactured as per standard fell measurement which is 5-7 inches as per total length of the kilt. If you are new with buying Jackets online then this measuring guide is going to help you in that. So follow this Jacket Measuring guide for buying your exact in best fit position. It is really important to measure the jackets first as you may get over or under-size Jacket and may ask for return or exchange. So to avoid such situation you need to measure yourself and get your Jacket in best-fit size. So to help you out below simple measuring steps will help you to measure the size of your Jackets without getting measured wrongly. Lift your arms and wrap the tape measure around your chest at the widest point or ask someone to help you out. Put your arms down. Stand tall and ‘at ease’. Do not over inflate your chest by holding your breath so just relax and measure. Just stand and breathe normally. Measure loosely around the chest at underarm height while wearing a t-shirt. Measure loosely around your “True Waist” at your naval while dressed in a shirt to get the best-fit. Put on a well-fitting suit jacket. Keep your arms at your side. Measure from shoulder joint till the end where other shoulder body ends. It is basically measuring the back length between both shoulders. Put on a well-fitting suit jacket or any other similar jacket to get the best measure. Keep your arms at your side. Measure from the shoulder seam (the top of the sleeve where it meets the jacket body) to the cuff. If you do not have a suit jacket, measure from the edge of the shoulder, down your arm to where you’d like the sleeve to end. Typically, jacket sleeves end 1.5″ to 2″ above the base knuckle of the thumb, breaking at the wrist or slightly lower. Roughly 1/4″ to 1/2″ of shirt sleeve should show below the cuff of the jacket. Stand straight and ask your partner to measure your body from the back side, it will be from the end of your collar till your waist point or as per your choice of Jacket’s length.